Restore color and clarity to old photos with easy-to-use software from Vivid-Pix. 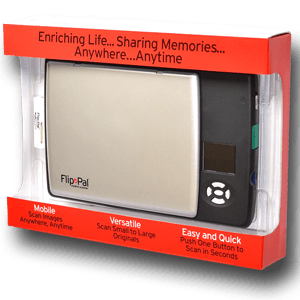 Record voice memos and create talking images with Flip-Pal's built-in StoryScans software. Share across multiple social platforms with the click of a button or create high quality keep sakes such as printed photobooks and frame-able prints. Serial Key provided in the confirmation email. For Windows computers. 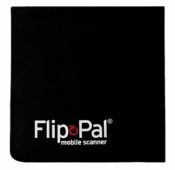 Flip-Pal Cleaning Cloth: Clean fingerprints and smudges from your Flip-Pal mobile scanner with the generous 10” x 10” microfiber cleaning cloth. 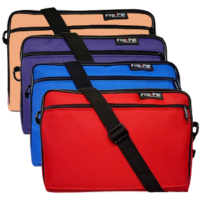 A plush cleaning cloth, with rounded corners and a screened 2-color logo, easily slides into the pocket of your Deluxe Flip-Pal Carry Case – keeping it handy when you are on the move. Drape it over 3-D objects when scanning them to give a contrasting background.